Using this idea, one would expect immigration to cause wages to fall. It seems obvious. Increasing the supply of labor will push the equilibrium price down. Won’t it? Not so fast. At best, Supply and Demand is an approximation. If the market were frozen in time and all variables were somehow fixed except supply, then sure, a rising supply of workers would cause a falling price of labor. Maybe. I call this kind of thinking the most common economic error. Just how are we to freeze the economy the way a camera freezes a scene, and yet change that very economy by adding more workers? There is no such thing as Economic Photoshop. Static thinking is tempting because it’s easy and seems to appeal to common sense. To borrow a phrase coined by Wolfgang Pauli, it’s not even wrong. As with every kind of aggregate quantity that economists like to measure, supply and demand are not forces that impel market participants. Hiring managers don’t input the quantity of workers into an equation, and get the wage from that. They’re concerned with something quite different, and much easier. They want to make a profit. Suppose a worker can make 10 hamburgers an hour. The non-labor costs add up to $3.50, and the customer is willing to pay $5.00. A simple calculation tells the manager that a worker will generate $15.00 per hour ($5.00 – $3.50 = $1.50 x 10). He therefore cannot pay more than $15, or even close to that. He has to offer at least $8 to attract workers. That leaves him a tight profit margin because there are work breaks and slow times during the day. The supply-and-demander will at this point demand, “well if you add more workers competing for the same job, won’t the hiring manager be all too happy to pay less than $8?” That’s the same fallacy I described above. It presumes that we can hold constant the number of restaurants, burger-eating consumers, and even the percentage meals people eat out. We cannot presume that we can change only the number of workers. Labor doesn’t work as the so called Law of Supply and Demand predicts. America once had by far the greatest immigration, and at the same time it had by far the fastest wage gains. To understand why, we have to look at what supply demand is trying to approximate. Let me explain. The first unit of a good is bought by the consumer who places the highest value on it. For example, bakeries have long bought wheat to make bread. No higher use of wheat exists than eating it. We need food to live. When farmers increased efficiency and output, then pet companies could put wheat into dog food. With further price cuts, home decor companies could put wheat into wallpaper paste. As it gets cheaper still, toymakers could make it into a sculpting material for toddlers. And so on (these examples are just my suppositions, so take then with a grain of salt). The price of wheat is set by this marginal user, because that’s the buyer who will walk away on the first uptick. In other words, the price of wheat is what the maker of Play-Doh can afford to pay. If farmers can produce even more and sell it to the market, who knows what the next lower use of wheat is? Maybe someone will make recyclable boxes out of it. The principle for every commodity is the same. As more is produced, the price has to drop to accommodate the next lower use. The marginal utility of wheat declines. So does the marginal utility of copper, crude oil, iron ore, and every other commodity (except gold, but that’s a whole ‘nother discussion). 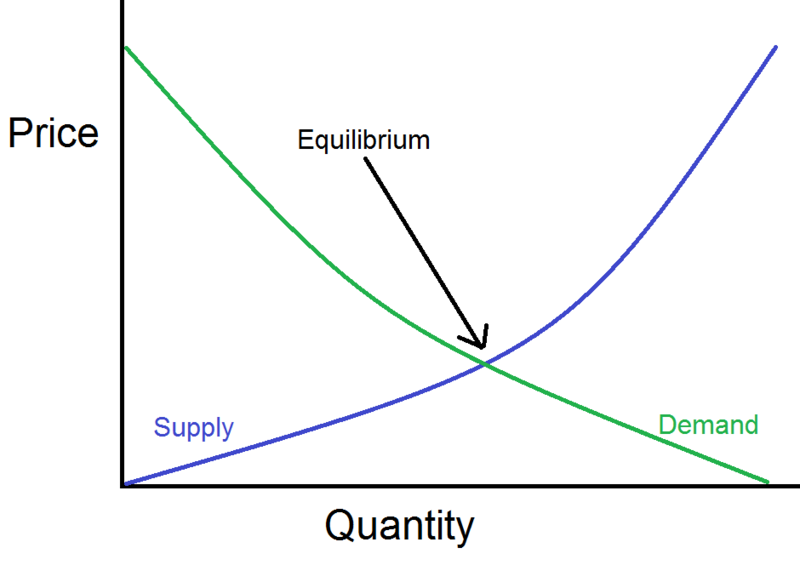 People say that the price has to fall to find a new equilibrium on the demand curve, but they do not see the cause, declining marginal utility. They see only the effect. This brings us to human labor. Is work like wheat, descending from high uses to ever-lower uses? The exact opposite is true. Before the Industrial Revolution, the vast majority of people worked as laborers in agriculture. The work was not only back-breaking, but offered very low value. Ever since then, developed economies have employed more and more people. But they are not employed in lower and lower jobs for them (question: what’s lower than mucking out a stall for a horse?) They are employed in higher and higher jobs. Work is so advanced today, we produce such high value products, that people from the 18th century could not have even imagined it. The marginal utility of human work does not diminish, as the number of workers increases. As the size of a market grows, the value of firms and workers within it rises. This entry was posted in Economic Theory, Free Markets on March 20, 2016 by Keith Weiner. This essay is not intended to address a crisis that may be occurring on the border at this time. I make no comment on that. Nor does it discuss the issues around war, such as how to deal with citizens of enemy nations. This essay is not a policy proposal, it does not set out, for example, when an immigrant can become a citizen and attain the vote or what to do to immigrants who commit crimes. It has but one purpose: to enumerate and respond to the common arguments used in favor of an impenetrable and guarded border fence to shut down immigration. Suppose you were born in a country that outlawed normal life. North Korea comes to mind. Venezuela is a slightly less extreme example, and there are many other examples which are slightly less bad than that socialist worker’s paradise. I phrase it in these terms, because this is the essence of the issue. People are rightfully fleeing places where they cannot live. Anyway, suppose you are in a place where life is a living hell. Every day, you are forced to beg and steal scraps of food to somehow stay alive. The best you can hope for is to subsist, one day at a time. You must avoid the gangs and the secret police. If you could somehow scrape together the money to escape to America, would you? You would take a job paying minimum wage—or less—doing long days of unskilled manual labor, if necessary. At least in America, you can work and you can begin to build a better life for yourself and your family. But you notice that people call you “illegal.” They don’t refer to any crime you commit, because you are no criminal. You never steal from anyone, hurt anyone, and or do anything else that could objectively be called a crime. You work hard for every penny you earn. But they call you “illegal” anyway. You come to realize that when they say illegal, they refer to you, not your actions. Your very existence so utterly offends them that they think you are crime incarnate. You notice that most of them drive faster than the posted speed limit. Many don’t register their old handguns or refuse to pay tax when they sell a gold coin. They traffic in old toilets, which flush more than 1.6 gallons. They break the law in numerous ways. On Facebook, there is a common meme that laughs at the statistic that everyone commits three felonies per day. Their crimes don’t bother them in the slightest, because they aren’t hurting anyone. They do get the concept of victimless crime, at least when they themselves are made into criminals by nonobjective law. However, for you, amigo, none of that matters. “The law is the law,” they assert. “The law must be obeyed,” and they don’t mean the speed limit law here. They mean the law that does not allow you to live. Obviously, you are not going to oblige them by dying. This is the issue for you. Going back to hell may well be your death, or the death of your family. This is the monstrous injustice of anti-immigration policy. Now let’s look at the arguments used to justify it. The most intellectual argument is that immigrants bring bad ideas with them. Though I have not seen it phrased this way, this implies that we could build a Great Wall (or a Berlin Wall) to keep out socialism, fascism, cronyism, corruption, and the ideas of Kant and Marx. Surely, there would be no Che t-shirts if the wall were tall enough. I find this argument unconvincing. In this era of radio, television, and the Internet, it’s the policy equivalent of locking the barn doors after the horses are not only out, but sold to the Saudis, and earning big purses racing in Abu Dhabi. Rotten ideas are not only here in America, but they have predominated for decades in our universities, media, and popular culture. A lame duck president said, “I’ve abandoned free market principles to save the free market system.” When our current president was a candidate he said, “I think when you spread the wealth around, it’s good for everybody.” We have a pejorative term for the wealthiest percentile of people, and one for bankers. Hollywood celebrities pose for pictures with socialist thugs like Hugo Chavez. These ideas are mainstream. Even conservatives will defend half a dozen of Marx’ ten planks. If rational ideas prevailed in our culture and most people held to a rational philosophy, then evil ideas would find no fertile ground here. Proud people of healthy self-esteem who understand liberty, find nothing attractive about socialist utopias, death cults, thieving parasites, or paralyzing bureaucracy. If you are un-persuaded, and you still believe that we have to keep out people with bad ideas, then you have to answer the following question. Are bad ideas intrinsically compelling? Suppose a Marxist chants slogans on a street corner, or finds a willing American newspaper to publish his letter. Is this a threat to Western Civilization? Are reality and reason and liberty so weak and so un-compelling, that they are blown away by mindless communist propaganda? At best, I think this argument reduces to another one that’s much more common. This argument does not address ideas, but voters. Immigrants vote socialist, opponents of immigration tell us. But do they? I rather doubt that it’s nearly so prevalent as we’re told, though I don’t have the statistic. It doesn’t make any sense to me. These are people who have scrimped and saved to go to a foreign country. Many have risked their lives, and most of them are not fluent in the language. What motivates them to do this? I doubt it’s typically a desire to bring to the US the same socialism that forced them to flee. What if immigrants are not voting for Democrats for their socialist policies, but for their pro-immigration stance? That would be a tragic irony to this argument. If the Republican Party stakes out the anti-immigrant position, then no one should be surprised when immigrants vote Democrat, along with their extended families, friends, and supporters. The presumption that immigrants vote Democrat leads Republicans to oppose immigration, which leads immigrants to vote Democrat. Mr. Foot, meet Mr. Gun. Blam! Incidentally, while I am criticizing the Republican Party, this very same issue is hurting them elsewhere too. Do gays all want socialism? Or do they want legalized marriage? Do women all want socialism? Or do they want legalized control over their own reproduction? Do biologists and other scientists want socialism? Or do they want legalized stem cell research and other scientific inquiry? Many members of these groups turn to the party that promises what they want. Moving on to the next argument, I hear often that an immigrant is like a trespasser or a burglar who breaks into your house. Think about what this argument says. It says that the nation is owned collectively. If you are in the group, then you are part owner. If not, then you are a threat to the tribe. Today, it’s phrased in terms of criminal trespass, but it’s a primitive view of belongers vs. outsiders. Of course the country as a whole is not owned, and certainly no collective has a right to violate anyone’s rights. Rights are neither a group benefit, nor a grant made by the government. A related argument is that immigrants are taking our jobs. This argument is thoroughly Marxist. Thus, it’s ironic that it so often comes from conservatives, Republicans, and even some libertarians. Our jobs? A job is a contract with an employer, not a birthright for an individual or a group privilege. If someone else is hired, but you are not, there is no injustice. If members of one group get hired and members of another group do not, then there is no cause for the government to interfere. Jobs are not zero-sum. Under certain conditions, jobs are created and wages are rising. Under other conditions, jobs are stagnant or even destroyed. What conditions? Left free from coercion, people find ever more ways of coordinating their productive activities. Increasing production means hiring more people and paying them better wages. However, when the government intrudes it reduces coordination, which means it reduces productivity, employment, wages, and quality of life. I proved this in my dissertation. One form of government intrusion is to block people, goods, or capital from crossing the border. It may have taken a genius like Adam Smith or Frederic Bastiat to provide the original arguments to debunk state control, central planning, and government favoritism for cronies. However, today, a smart 8th grader can understand and make a cogent argument against this nonsense. I don’t think anyone believes in bad economics for the sake of bad economics. No, there are two reasons people support junk economics. One is they want to get something they couldn’t earn in a free market. They seek protectionist measures to keep out competition. The other is they can see that the economy isn’t working properly. It is a fact that employment is far below its prior level. Such jobs as do exist pay lower real wages. Most people feel it at some level, and they’re angry. They should be angry, but we should place the blame where it belongs. Taxes, regulations, litigation, and especially the Fed are the cause. Please don’t take out your anger on poor immigrants. The idea that the economy is zero-sum is a Marxist idea. Lovers of America, the Constitution, and liberty should have nothing to do with it. The next argument is that immigrants come here to collect. We should not allow immigrants because they will only end up on welfare. Compensation is when you deliberately and knowingly do the wrong thing, supposedly to fix a problem elsewhere that you cannot or do not wish to fix. My example is to let the air out of three tires if you have a flat. Shutting down immigration is compensation for the welfare state. We who don’t want to see the taxpayer bankrupted will do better to fight welfare, than to fight immigration. This leads to a question I have asked several times, and received no answer. Why does Immigration and Customs Enforcement go after employers? We’re told that immigrants are here to sell drugs and commit crimes. However, it’s obvious that you won’t find drug dealers, welfare queens, pimps, and bank robbers working at or below minimum wage in the hot sun. So why go after employers? There is only one reason. It is to protect us belongers from losing our scarce jobs to those outsiders. Can any of these arguments be applied to block immigration between the states? On Facebook recently, I saw someone post (half) jokingly that Texas should pass a law to keep out anyone from California who voted for its welfare schemes or high-speed rail boondoggle. Logically, there is no reason they couldn’t be applied to interstate immigration. North Dakota has low unemployment. If they continue to allow open immigration, then pretty soon their unemployment will rise to the unfortunate heights of the rest of the country (maybe they should thank their harsh weather for putting the brakes on this). The next step is to apply it to immigration within a state, from city to city. We wouldn’t want all of those Tucson people coming here to take our Phoenix jobs, would we? The end game is the socialist dictatorship, which clamps down on the right of people to move as they wish. The elephant in the room that must be named is some people of the anti-immigrant persuasion are motivated by racism. I don’t believe this is the majority, but it exists. They don’t dare openly declare their feelings, at least not in any forum I read. Instead, they couch it in another argument. One reason I started this essay off with a story was to establish the context and put the reader into the shoes of a recent immigrant. I had another reason as well: to illustrate the problems in the anti-immigration position. No one who fled a living hell will go back willingly. So what will be accomplished by demonstrating one’s resentment by slinging the name “illegal” at a man? He will react. He will feel like he is in a no-win situation. He may himself become resentful, and in that state he may adopt bad ideas that he did not originally hold. What will happen if the law attacks his employer and renders him unable to keep a job? What would you do if you were permanently rendered unemployable by law? He will take welfare if he can get it. The only alternatives are to starve, to go back to hell, steal cars, or sell drugs. Nothing good can come from forcing someone to make that kind of choice. Though it’s not my purpose in writing this essay, if your concern is whether the GOP will win elections, it’s hard to think of a more effective way to repulse a large voting bloc. However, I think there’s something much more important at stake. It is the theme of most of my writing on the gold standard. We need to rediscover and return to the principle on which America was founded. It is the principle that everyone has the individual rights of life, liberty, and property. Let’s fight for those rights. Let’s fight to repeal welfare and to restore the Constitution and the Republic that was built on it. It’s the right thing to do, and it also works. This entry was posted in Free Markets on August 22, 2014 by Keith Weiner. In the Future, Will Everyone Be Unemployed? Recently, I have seen a lot of discussion about the future of employment. Many people, from futurists to Leftists, are saying that machines will replace people and most people will be unemployed. This is hogwash, though it has been popular for at least 200 years, when the Luddites were smashing machinery. Perhaps they didn’t know better, in the early days of Industrial Revolution. Maybe they really didn’t think of machines as providing an escape from drudgery. They might not have thought that people were freed from long days of backbreaking labor. They may not have considered that increasing productivity benefits the worker, the investor, and the customer—pretty much everyone. Today, we don’t have their excuse. Economics teaches these points clearly, and this is not my point in writing this essay. My point is that we have too many closet central planners, screaming to get out. Workers are afraid of losing their jobs. Social thinkers worry about unemployment. Economists refuse to understand rising productivity. Futurists fret that there is a dark side to progress. All of them are lending their support to central planning, whether they realize it or not. Implicit in every one of these views is a simple confession. The worker, the social thinker, the economist, and the futurist do not know what the next big industry, the next big employer, will be. And, it’s not their job to know that! This is the flaw in central planning. The central planner does not know. 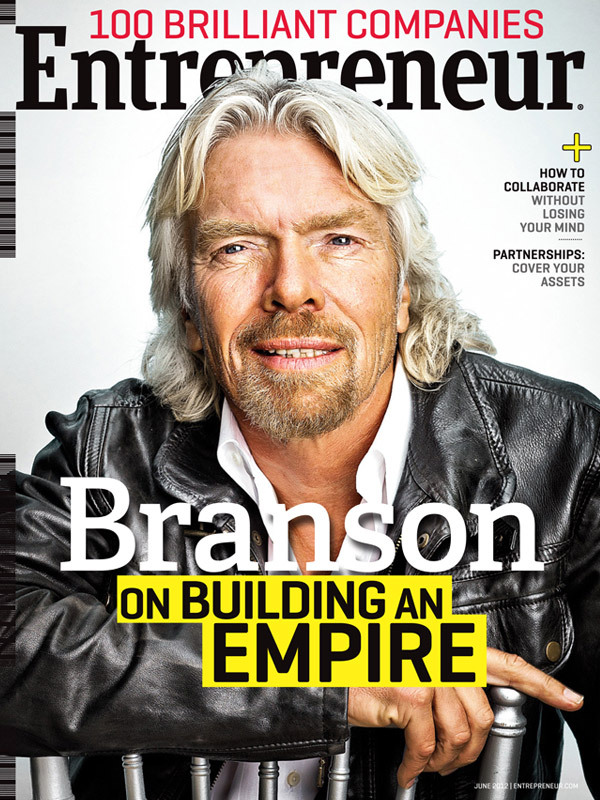 It’s the entrepreneur’s job to figure out how best to put people to work. This entry was posted in Free Markets on August 3, 2014 by Keith Weiner. A recurring theme of mine is that one cannot understand the world in terms of the linear Quantity Theory of Money. Let’s look at the cost of shipping. The money supply has certainly been expanding since 2008. And yet the price of shipping has almost completely collapsed. From a high over 11,000 it’s now down to 755. This is a drop of almost 94%. The Baltic Dry Index is a dollar price of moving the major materials by sea. The chart shows from just before the acute phase of the crisis to today, July 16, 2014. Neither the money supply nor supply and demand adequately explains this collapse. Supply and demand may be a tempting model, but it raises more questions than it answers. Is it falling demand or rising supply? Why would supply rise so much? Why would demand collapse? Could both be occurring at the same time, and if so are the business managers and their bankers that blind? The Austrian Business Cycle Theory is a much better way of thinking about this. Ultimately, this graph tells a story of credit expansion and credit contraction. During the expansion there was lots of demand for shipping. Naturally this led to malinvestment in ships. During the contraction, the ships aren’t needed but they cannot be unmade. More importantly, the money borrowed to finance them cannot be unborrowed. Why was there so much malinvestment? The rate of interest has been falling during this time (and much longer). The lower the rate, the more attractive it is to borrow to buy a capital good, such as a bigger ship. On this graph, the interest rate on the 10-year US Treasury bond is added. The correlation isn’t perfect by any means, but there is something here. It is important to realize that a company that borrows to malinvest sees a profit at the time. That’s what so deadly about central planning of money and credit. The central planners push down the interest rate, and this sends a false signal. The shipping companies and financing companies calculate the profit in building new ships. They are neither stupid nor incompetent. They may not lose money at all. The losses may go to some existing shippers, particularly those who previously built ships, with money borrowed at higher interest rates. No matter who it is, we can be certain that somewhere in the world, there are debtors being put to the squeeze. And with equal certainty, we can say that their lenders—including banks—have assets on their balance sheet that will need to be written down (or written off). And when that happens, it adds to the bust. Desperate lenders sell assets onto whatever bid they can find. Asset prices begin to plunge. Arbitrages connect those assets to other assets, not to mention margin calls. Workers lose their jobs, investors lose their money, and businesses close. The dollar, with its interest rate dictated by the monetary politburo, is destroying people’s lives. One important virtue of the gold standard is that it has a stable interest rate, set by the participants in a free market. It worked and it will work again when we finally reject the regime of irredeemable paper money. 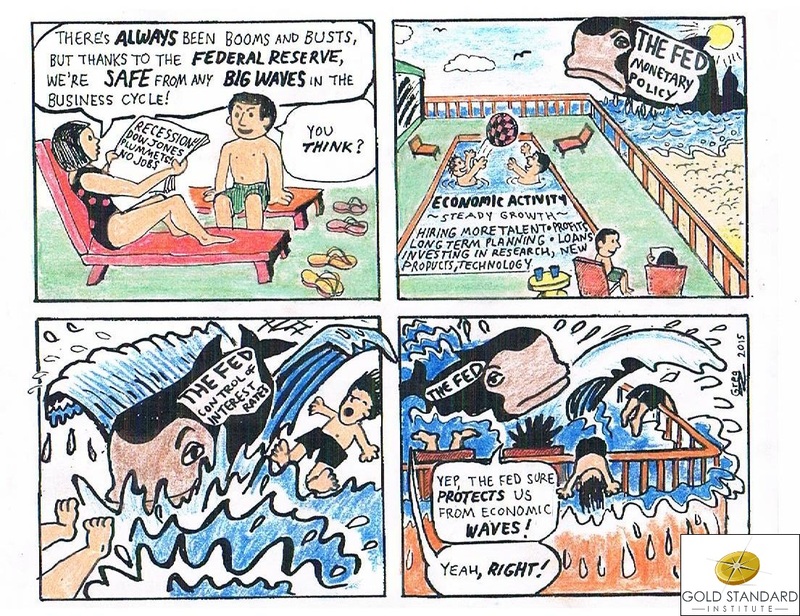 This entry was posted in Free Markets, Monetary Science on July 16, 2014 by Keith Weiner.